Did Arun Shourie gift the Tatas 773 acres of land which should have been demerged before VSNL’s disinvestment but wasn’t? Buy one, get one free is a time-honoured way to sell merchandise. But when the same principle is applied to the sale of a crown jewel, it attracts controversy. This is what happened nearly nine years ago, when the NDA government disinvested in Videsh Sanchar Nigam Ltd (VSNL) in favour of the Tatas. It gave away for Rs 1,439 crore a strategic public sector undertaking (PSU) flush with cash reserves, a monopoly over international and STD calls, infrastructure worth hundreds of crore and over 1,200 acres of land. Of this, 773.13 acres was surplus (a land bank meant for future expansion) and at least 387 acres should have come back to the government and the rest to earlier shareholders. The 773 surplus acres were valued at only Rs 151 cr. In ’02, just the 67.5 acres VSNL holds in GK was worth Rs 135 cr. However, neither Arun Shourie as the disinvestment minister nor Pradip Baijal as secretary in the same ministry were paying much attention to this huge land bank circa 2002. The book value (when VSNL procured the land in the ’80s) of this 773 acres, distributed in Delhi’s prime Greater Kailash area and Chhattarpur, Pune, Calcutta and Chennai, was Rs 17.72 lakh. According to a draft NDA cabinet note (No. 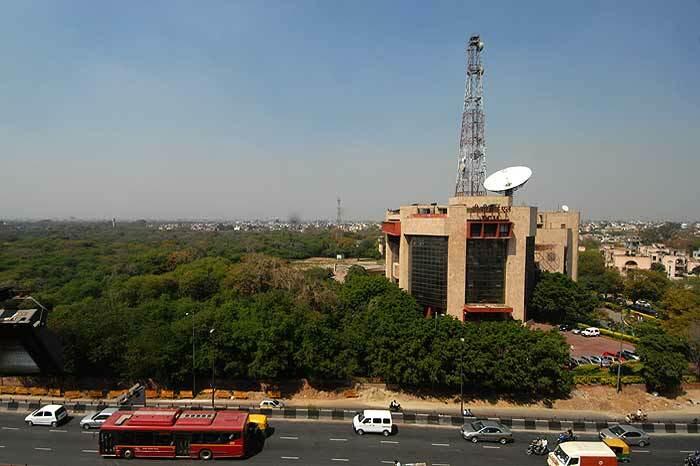 37-9/2002-OC) prepared by the department of telecommunications and accessed by Outlook, the total value of this land in 2002 was put at a measly Rs 151 crore when the going rate for an acre of land at the time in Delhi’s plush Greater Kailash was Rs 2 crore. That would have meant, in 2002, all of Rs 135 crore for just the 67.5 acres VSNL has in GK. Today, the same land is worth Rs 16 crore an acre. VSNL holds 58 acres in Chhattarpur—currently going at Rs 12 crore an acre—524 acres in Pune, 35 acres in Calcutta and 85 acres in Chennai. A reasonable estimation would put the current total value of the 773 acres anywhere between Rs 6,000 crore and Rs 8,000 crore. Manning the ship of disinvestment at this juncture was former journalist Arun Shourie who would soon also have the additional charge of the telecom ministry. Considered by many as the nation’s conscience-keeper, his track record in disinvesting several PSUs has been questioned on different occasions. His role in the disinvestment of VSNL was perhaps the most controversial of them all. 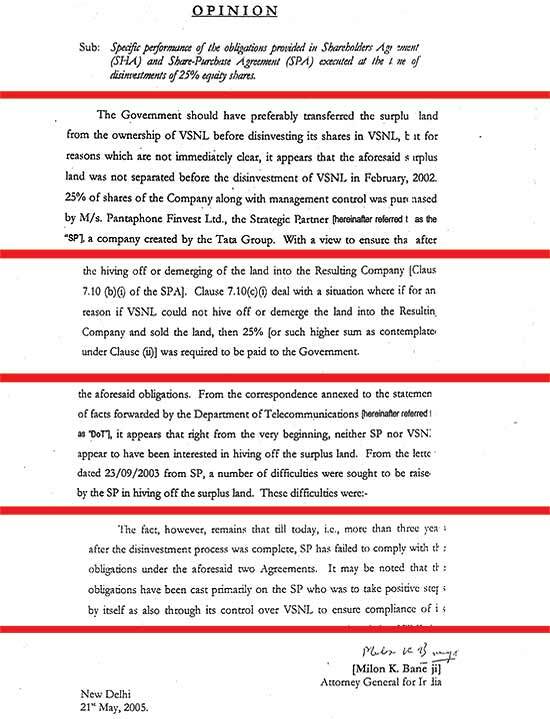 It was on January 21, 2002, just 10 days before receiving the financial bids for privatising VSNL, that the telecom ministry informed Shourie’s ministry that out of the PSU’s total land holdings of 1,230 acres, a little over 773 acres had been found to be surplus. Ordinarily, such a finding should have brought the whole disinvestment process to a grinding halt. 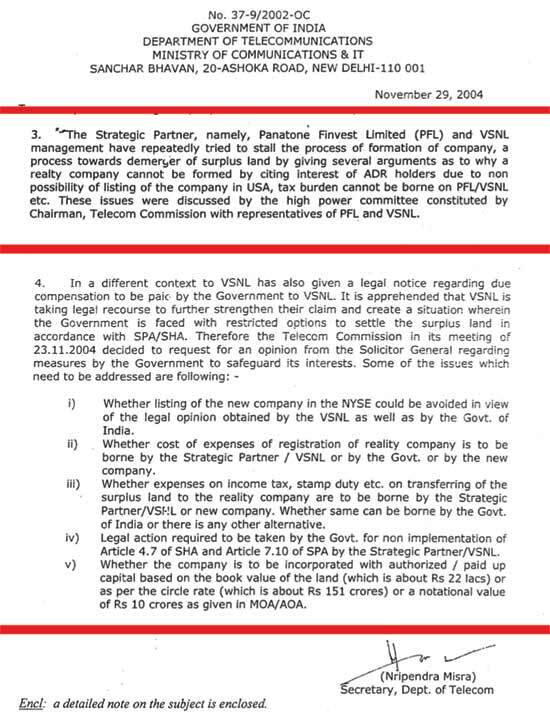 While the government was planning to sell a stake in VSNL, which was then and still is a listed entity, what would happen to the huge land bank it held? What was its value? Who was its owner when the public had a stake? The longer it waits for its demerging, the higher the returns on the land that wasn’t given to Tatas in the first place. These should have been disturbing and contentious questions for any ministry looking at parting with a strategic asset. But not so for Shourie and his team of bureaucrats who were steaming ahead with the proposed sale. Interestingly, heading the bureaucrats was Baijal, who would later emerge as a major player as an associate of Tata lobbyist Niira Radia. Cut to 2010, when Baijal’s tenure as chairman of the Telecom Regulatory Authority of India is being investigated by the CBI in the allocation of 2G spectrum by disgraced ex-telecom minister A. Raja. Hired by the Tatas, Radia lobbied for them in several sectors, and one of the first people to come on board was Baijal. Together, they also formed a consultancy company whose offices were raided by the CBI in December last year. The agreements signed between Tata subsidiary Panatone Finvest Ltd (PFL) as the strategic partner in VSNL and the Union government were clear that PFL would have to make every effort to hive off the land and return 51 per cent to the government and the rest to other shareholders. But after reams of correspondence and several efforts by the government, the land is yet to come back to the possession of the Union government despite nine years having elapsed. 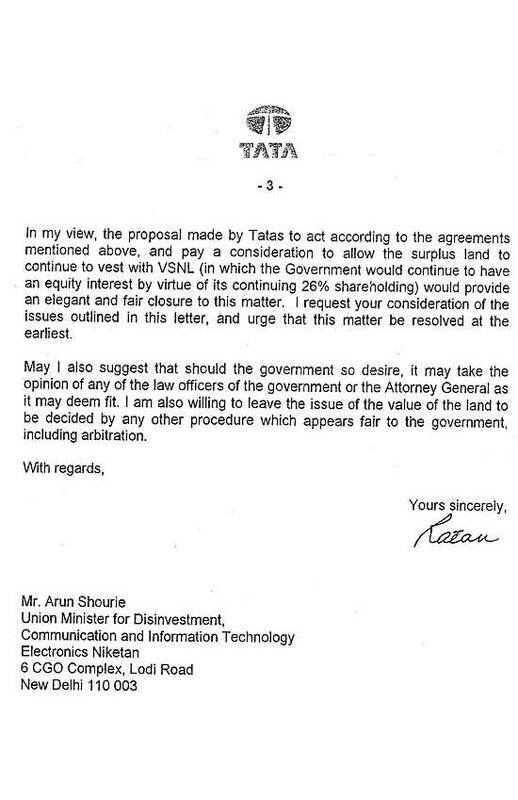 Outlook accessed a mountain of documents over a four-week investigation that clearly show that, aided by Shourie, the Tatas from the very beginning seemed disinclined to return the land. Correspondence between the key players and legal opinion now squarely place Shourie’s role under the scanner. In fact, any failure to hive off or demerge the land would mean VSNL getting it to sell, auction or develop it as it pleases. The longer it waits, the higher the return will be on the land that was, ironically, never given to the Tatas in the first place. In this regard, the legal opinion of the then attorney-general Milon K. Banerji dated May 21, 2005, a copy of which is available with Outlook, is very interesting. It questions Shourie’s failure to “demerge the surplus land even before the disinvestment took place. The government should have preferably transferred the surplus land from the ownership of VSNL before disinvesting its shares”. Banerji was categorical: the land should have been unambiguously with the government even before it contemplated privatisation. He also notes “...that from the very beginning, neither PFL nor VSNL appear to have been interested in hiving off the surplus land”. Omitting to mention his own subsidiary was stymieing a demerger, Tata made a ‘gracious’ offer: 45% of the old rate. So, who was creating difficulties in demerging and selling the land? Banerji points to a letter written by PFL to the telecom ministry on September 23, 2003 and says “...a number of difficulties were sought to be raised by PFL in hiving off the surplus land”. Clearly, by doing this, the Tatas would ensure two things. One, the land would continue to be in their possession, and two, this would mean that the price of the land would be kept artificially low, thus facilitating a cheap takeover at a later date. And if anyone had any doubts about Tatas’ true intentions, then these were laid to rest by none less than Tata Sons chairman Ratan Tata himself. 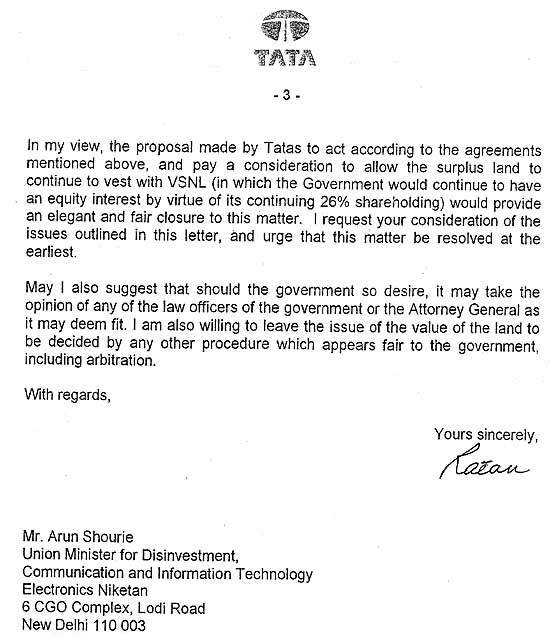 In a February 27, 2004, letter marked “private and confidential” and addressed to disinvestment and telecom minister Shourie, Tata made his case: “...the matter (of the demerger of land) remains where it was two years ago. What I am writing to you has been proposed by Panatone and is awaiting DoT’s consideration for over three months”. 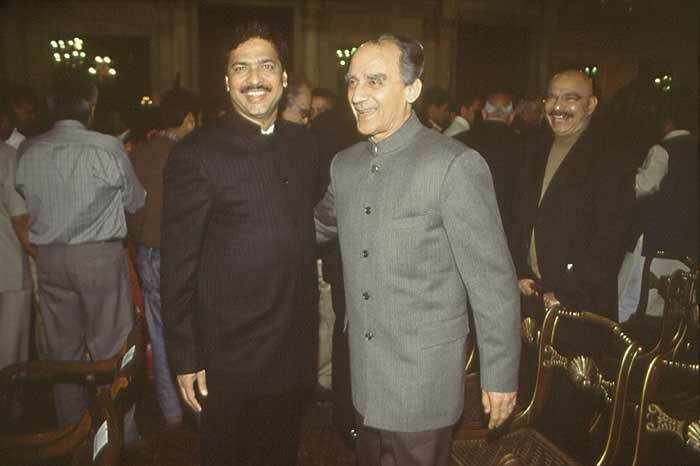 When contacted, Shourie said Outlook had been fed falsehoods. They are actually the findings of a CAG report. Tata quotes specific provisos in the agreements with the government and the other shareholders that if a demerger failed to take place, then the Tatas could pay 45 per cent for the land and take it over. 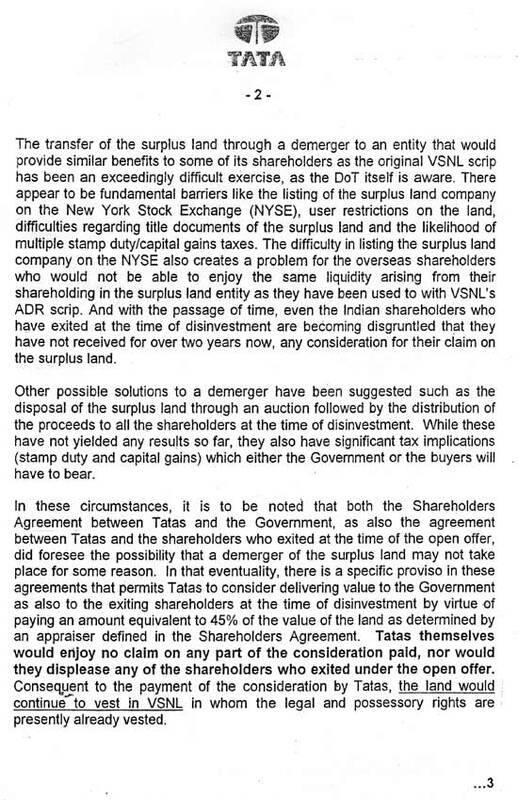 “Consequent to the payment of the consideration by the Tatas, the land would continue to vest in VSNL in whom the legal and possessory rights are presently vested”. In short, Tata’s argument was that since they already owned the land, they were willing to pay a paltry 45 per cent of the earlier value and take over the entire surplus. In his view, this would provide “an elegant and fair closure to this matter”. 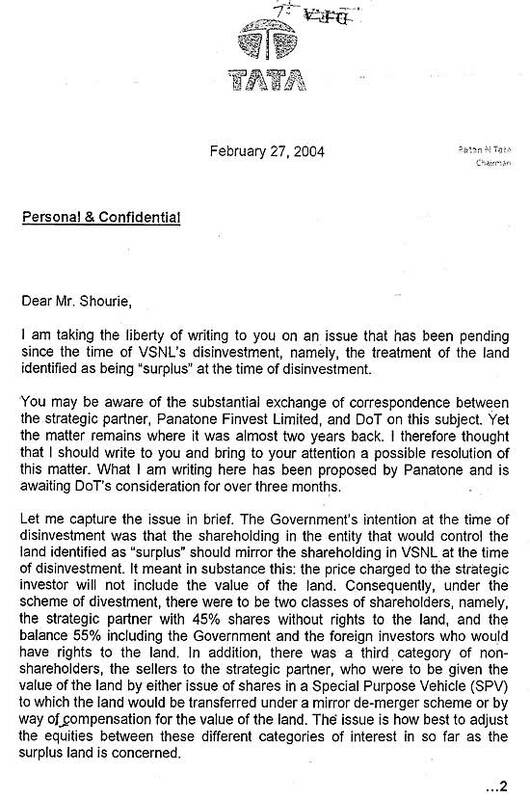 Tata failed to mention a critical little detail in his letter to Shourie—the failure to separate the land from VSNL was a result of the delaying tactics of his company. This was an “elegant and fair” solution to a problem of his own creation. Unfortunately for Tata, the NDA government lost the elections in the coming months and the matter would continue to linger on till today. In fact, the Telecom Commission in 2002, when the NDA was in power, had rejected all contentions raised by the Tatas on hiving off this land. They had called the Tata objections as matters that “do not concern VSNL” and the legal opinion furnished by them to buttress their arguments as “doubtful”. Banerji too would echo these thoughts two years later. Before Banerji, telecom secretary Nripendra Mishra too had raised a similar concern in a letter dated November 29, 2004, to the law secretary. Mishra feared that “VSNL is taking legal recourse to further strengthen their claim and create a situation wherein the government is faced with restricted options”. Once again, in January 2005, P.K. Basu, a joint secretary in the department of disinvestment (Shourie’s old ministry), shot off a letter to the telecom ministry stating that the Tatas are “in default of discharging (their) legal obligations”. A few months later, on June 5, 2005, then finance minister P. Chidambaram urged the then telecom minister Dayanidhi Maran to expedite this demerger “to avoid any complications which may arise” if the Tatas were to exercise other options. The Rs 1,402-crore tax liability Shourie waived off for VSNL was almost equal to the Rs 1,439 crore paid by Tatas! Finally, a year later, the CAG report noted that the delay in separating the land from VSNL before disinvestment “had the potential to conferring unquantifiable benefit from the sale of surplus land” on the Tatas “in proportion to its shareholding acquired from the secondary market”. In February this year, the telecom ministry finally invited the services of a consultant to help extricate themselves from this mess left behind by Shourie. Meanwhile, the massive loss that was caused to the government and the public exchequer continues to grow every day. When Outlook sent across a detailed questionnaire, Shourie contended that the magazine had been fed several “falsehoods” (see accompanying interview). Strangely enough, Shourie perhaps failed to realise that the “falsehoods” he was accusing Outlook of were the findings of a CAG report on disinvestment! So, is Shourie suggesting that the CAG is a liar? In appointing a valuer (person who values a company) for VSNL’s assets, the disinvestment department did not conduct any negotiations. 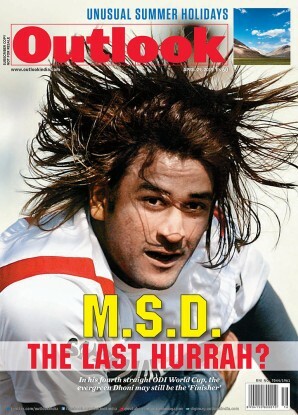 As the CAG report notes, it simply kept it “open-ended” and gave away the contract at the “highest quote”. When the CAG sought an explanation from the finance ministry on its failure to negotiate for such a critical player as the asset valuer, it failed to furnish a reply. There would be many more failures related to VSNL’s asset evaluation. Ironically, VSNL’s valuers also mentioned in their report that they didn’t get many important documents from Shourie’s ministry. In fact, this is what the finance ministry too admitted in 2006 after it took over the disinvestment ministry. So was the Rs 1,439 crore paid for the VSNL disinvestment fair? A key precondition for the VSNL disinvestment was that the bidder must furnish an earnest money deposit of Rs 500 crore in cash. However, even before the bids could come in, this was progressively diluted by Shourie’s ministry. First, it reduced the sum to Rs 250 crore, not as cash, but as an irrevocable bank guarantee, which was further reduced to Rs 100 crore. Later, the bidder received another largesse when the Union government decided to indemnify the bidder to the extent of 25 per cent of the total tax liability. If that was not enough, Shourie went ahead and helped wipe out a Rs 1,402-crore tax liability hanging over VSNL. The Tatas and Reliance had made their bids keeping in mind VSNL’s huge tax liability. By waiving off that liability, VSNL’s value could have gone up substantially. It would also, as the CAG notes, have “attracted more bidders” and “prevented the withdrawal” of a third bidder. But, as the CAG notes, “The ministry of disinvestment intimated the same to the bidders...on January 31, 2002, a day before the financial bids were to be opened on February 1, 2002, at 4 pm.” This means the Tatas actually paid a lot less than the real value of VSNL. 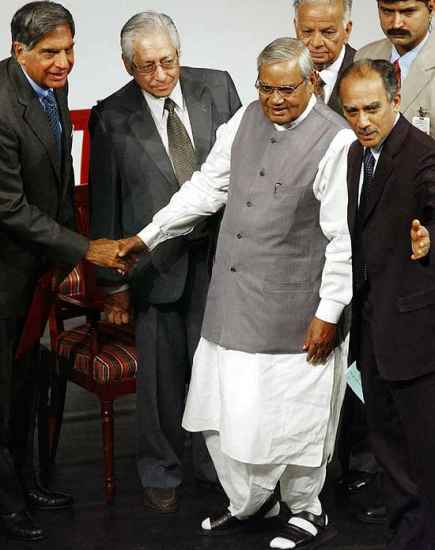 The benefits of Shourie’s efforts, therefore, went to the Tatas, not the public. Strangely enough, this liability (Rs 1,402 crore) was almost equal to the final value (Rs 1,439 crore) that was eventually paid by the Tatas. Shourie added some more icing on the VSNL cake. He ensured that the monopoly business that VSNL enjoyed as a PSU continued even after privatisation. While the national telecom policy of 1999 had promised this monopoly till 2004, the emergence of several players had nullified such a requirement and the monopoly officially ended in 2002. But not so for VSNL. Shourie, who had also taken over as the telecom minister, did not end it completely. It allowed private players to compete for incoming international calls but allowed VSNL to retain the monopoly for all outgoing international calls. As a result, the price of international calls was kept artificially high, and other private competitors like Data Access were wiped out. Had Data Access been allowed to compete, it could have saved the government anything up to Rs 2,000 crore. Not just that, Shourie also gave monopoly status to VSNL on all STD calls emanating out of BSNL and MTNL, both PSUs the biggest telecom companies with the biggest business at that time. So, in effect, while BSNL and MTNL bled, VSNL laughed all the way to the bank. Honesty’s certainly not been preferred policy in the VSNL affair. Tatas made the money, the nation remains shortchanged.